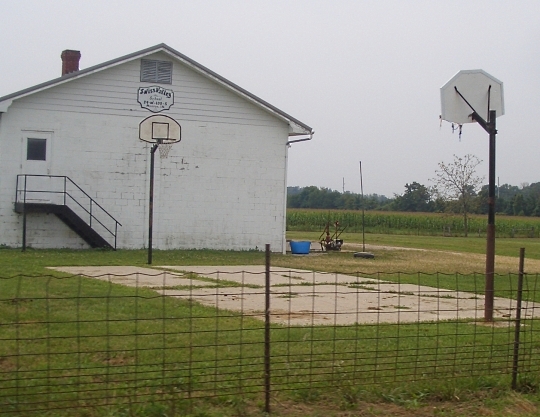 We haven’t done one of these in awhile, so here are ten photos from the Adams County, Indiana Amish settlement. As you can see, it was a fairly grey day, so that didn’t help. Which do you think came out best? You are right Alice Mary, it says “accidents”. You also notice the orange warning cone, which is probably there for drivers backing up, as it was a fairly tight area. There is something really nice about these self-service stands. I guess they make sense unless you are having a steady stream of customers, and most of them aren’t, it’s sporadic. Or have the kids out there manning the stand, you see that too. I have to agree with Alice Mary — The produce stand, house, with the laundry out to dry, shows their ways of the “simple life”, although not easy! I, like others, miss those days of “trusting” your fellow man. I also like the first one, which to me, shows the family “unit” up early, going somewhere together! The fog, to me, represents a “peace” and stillness, in their every day lives! I’m ready for a visit! 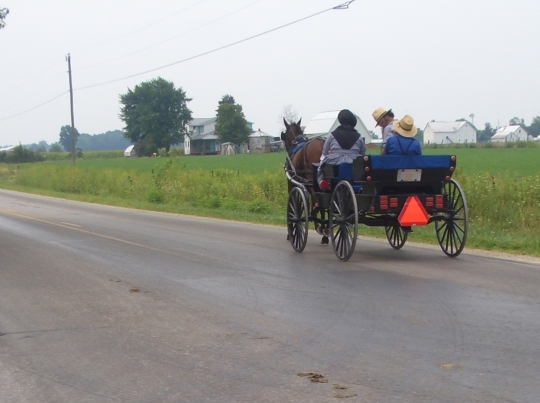 My husband has family in Indiana, near Amish country. Beautiful pictures Eric … thanks for sharing with us! Eric, I like the one with the red barn. 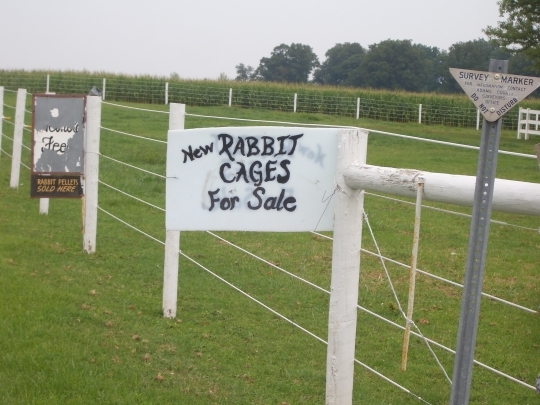 It would make a lovely cross-word puzzle. Thanks for all your posts; I surely do enjoy them! Thanks Faye, I actually think I’m due for a new camera, that one and some of the others would have probably come out a little sharper. I was fortunate the rain held off for most of the day. What nice photos. 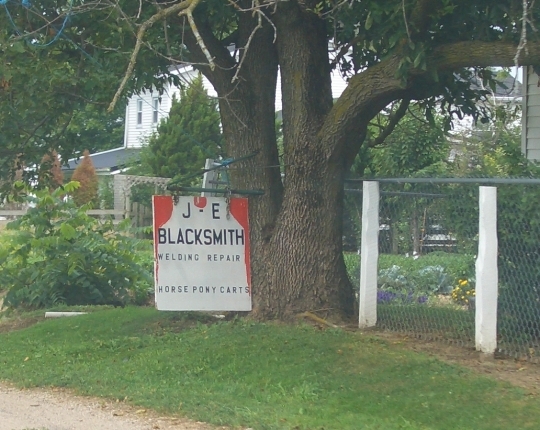 I particularly like the produce stand and the blacksmith sign and the intersection. Thanks! 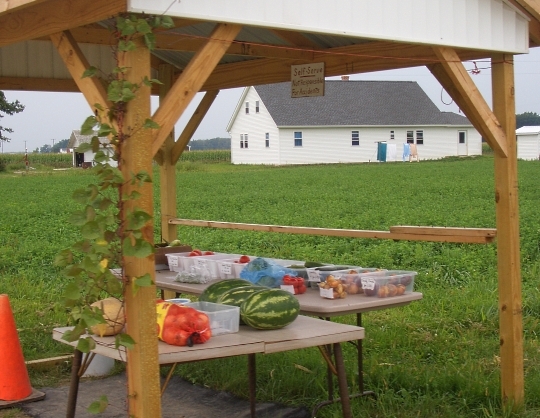 I’m with Alice Mary and SharonR and like the produce stand, not because of the quality of the picture but because of the deeper issue of being able to live in a community that has trustworthy customers, and enough character to risk putting their produce out. As for the up early in the fog I see something different. I see the value of a family sharing the uncomfortable but thrilling cold wet embrace of the fog and going off bravely and determinedly into that darkened world to overcome and face it together to reach their worthwhile destination (assumedly church). I appreciate these thoughts Robert, I should add I am not fishing for compliments at all by asking which came out best (as I have no illusions or desire to be a photographer 😉 ), however I think they are good conversation starters as we see here. Occasionally these self-serve stands get robbed, but not often enough to prevent people from doing it. My favorites are the 1st, 5th and last one. I am partial to the distance shots of people I guess 🙂 The first were families on the way to a local home auction, I was parked off to the side about to get out and visit the auction. 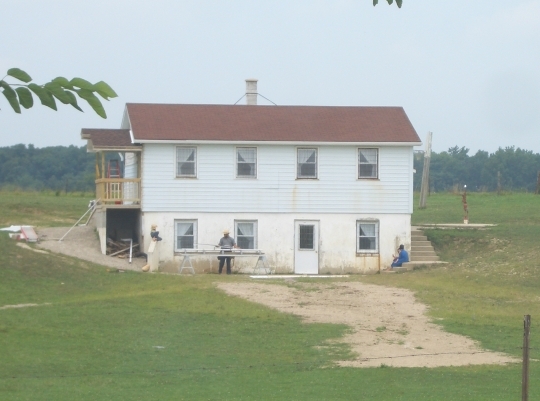 The last was a Saturday afternoon, a dad doing a little work at the schoolhouse while two of his kids kept him company. Love your photos! The first and the fifth shots were my favorites, but there really isn’t a bad one in the lot. Thanks, Erik! Thanks Erik. My earlier comment was not artfully stated, I wanted to emphasize the thought behind a self serve venture, but did not mean to disparage the quality of the photo while doing so. In fact all the pictures were good shots, each with a story to tell, and the produce stand picture had a quality tone which was both clear and colorful. Thanks for posting all of them. Definitely Robert, I didn’t take it that way at all. I know some people take photography more seriously (and the quality of their photos usually reflects that 🙂 ) but for me photos are just a fun thing to do. I enjoy trying to get half-decent ones but it’s more being out somewhere that I enjoy the most. Thanks again for the comments though. That is a hard decision. I enjoy seeing them all. All good pictures, Erik. Keep ’em coming! As usual, I enjoy all the different places you show pictures of. 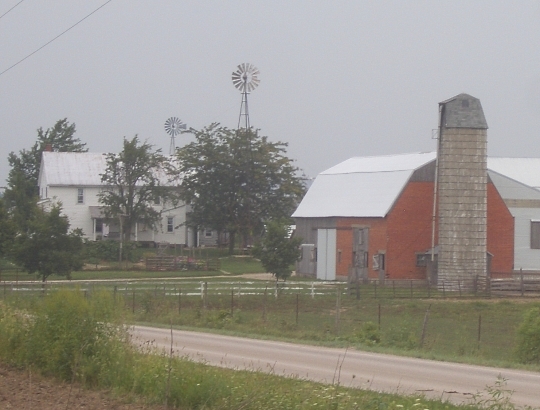 I have only been to a few Amish areas and looking at your pictures, I can dream about going to others. You, and all the folks that blog here, have a great weekend. 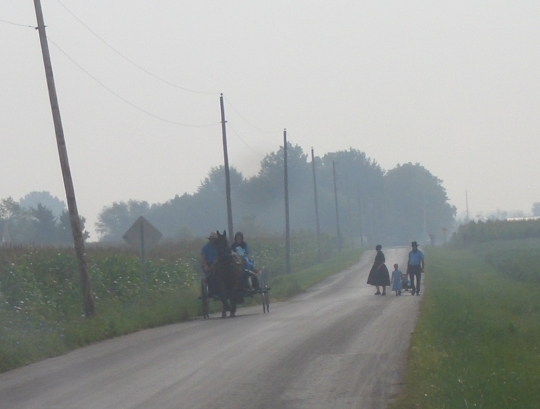 I rather like the first photo, “amish-families-adams”. I like the slight hint of fog in the air, and how it, and their slight distance from the camera conceals their identities. It gives it a ghostly touch. I also like number five “berne-amish-intersection”, it makes me think about how daily life would have been like had the car not come about yet modern street signs did. Beautiful pictures, both. On some rare buggies that I've seen a few have air suspension! The first photo is lovely. To me, the fog/mist helps exemplify the timelessness of this lifestyle- the children walking show that this lifestyle and religious belief will continue into the next generation. 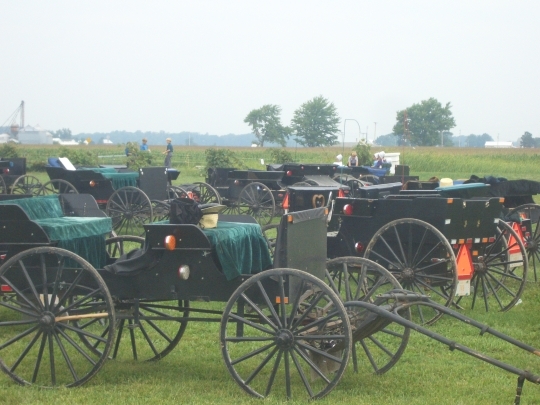 The man pulling the wagon behind him also signifies this. I’m guessing that the smallest child climbed out of the wagon to walk for a bit. I liked the firts, fifth, ninth and the last photos the best. 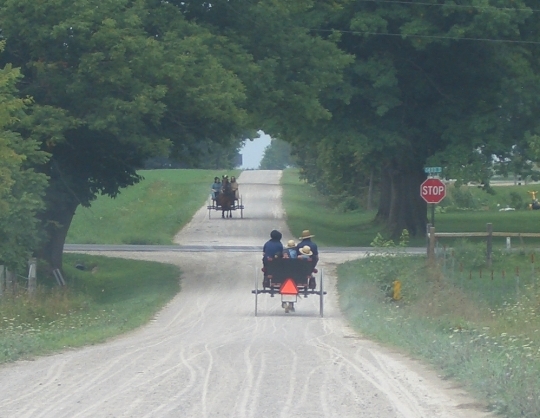 That’s what I envision when I read a book about the Amish particularly the Amish fiction books where they describe the structures and going down the roads in their buggies.